Have just read blog post about the subject (in Russian). I’m an absolute “fan” of definitions which “forgot” to define things and just trying to explain them with examples. Such as “it is when you have …”. Fabulous. And useless. I do agree with DIP description, partially agree with DI description and find IoC description plainly wrong. Yes, sure, difference between a library and a framework is defined by who controls execution environment. IoC is related to that topic, but it is not this difference itself. Inversion of Control is a principle that allows one part of code (often general and reusable) to communicate with another (more specific) without intimate knowledge of its implementation. It is an idea basically, and an “abstract” one in some sense. There is a couple of concrete techniques that implement the IoC principle: callbacks, interface dispatch, dynamic call dispatch, virtual calls etc. One could remember typeclasses from Haskell. Even an abstract factory pattern may be seen as some sort of IoC, as it gives its client ability to construct instances of product without knowing its concrete class. Sure, frameworks are using IoC almost always, but IoC doesn’t implies a framework by itself. When you call Win32 API function that takes a callback – you’re using IoC without any framework involved. Now, Dependency Injection is one of aspects that allow to achieve IoC: if some code creates its dependencies itself (e.g. with direct calls of their constructors) – it definitely can’t be unknowing about details of their implementation. It knows precise type – indeed a very strong variant of coupling. Injecting such dependencies instead by some external entity is what implements IoC principle here. In other words, DI is one possible technique to achieve IoC. IoC-container is a piece of software that allows applying and reusing different IoC techniques in your code. Usually a library. For example, Windsor container supports several types of DI, automatic typed implementation of abstract factories and some more. And with all of that it is obviously a pure library, not a framework. Hence, IoC-container as a term is not “meaningless”. I’d rather say that defining IoC as key difference between library and framework is meaningless. Finally, Dependency Inversion Principle is a guidance that dictates which is the most promising way to structure software. Namely, higher levels of abstraction should not depend on lower levels. For example, module responsible for publishing reports should not depend on sockets to send them. It is easy to imagine sending reports via email, file, web-service, printing or RSS, as well as formatting them in dozen of formats. Having knowledge about such low-level details makes code likely candidate for rewriting later. My target is to make it work smoothly with WPF, but for WinForms or with bare UIA it works as well. WPF provides several methods of validation, most common are implementing IDataErrorInfo on ViewModel, implementing custom ValidationRule, use ValidatesOnException whatever. But for MVVM pattern really only IDataErrorInfor is good. The problem with other approaches – well, the VM can’t know with them if error happened. Yeah, user gets error indication, error is handled… but the VM thinks everything is good. Suppose VM controls if OK button is enabled or disabled (e.g. via CanExecute of bound command) – how could VM know when to disable the button if it doesn’t know if error happened? Let’s try to imagine absolutely trivial example: window with TextBox and a Button. User should type integer in the TextBox and click the button. If user doesn’t enter a number at all or entered some invalid value (like ‘abc’ or non-integer like ‘1.23’) – button should be disabled and TextBox should have normal error notification (default WPF red outline is ok). VM most probably needs to implement INotifyPropertyChanged for its properties, but it is not the case here, so I’ve omitted these. Can you see the problem already? Value has int type. When user types ‘abc’ in the TextBox – Value won’t receive changes until value becomes parseable integer again. Binding just can’t pass them to VM – it has no means to do so. And thus we can’t notify Ok command that it can’t be executed right now. Moreover, if OK button is supposed to save something… imagine a scenario: user entered 100 to the TextBox, this value has propagated to Value property, then user accidentaly typed ‘o’ (letter o) instead of ‘0’ (zero) – they are pretty close on my keyboard – and clicked OK. Oops. We just overwritten old data with 100, when user thought it will be 1000. Definitely not good. So, what is the solution? One apparent one is to change Value’s type: let it be a string. We can parse it in the VM and determine if it is correct, and disable Ok command. It will work, of course, but if you have two dozens of such pseudo-integers – VM becomes a pile of ToString() and Int32.Parse() calls here and there, which hides all the logic. A mess, shortly said. Don’t be amused where this precise arguments are came from – it will become clear after a couple of minutes. So, if our validation mechanism could get instanse of IUIValidationErrorSink object – it could notify interested parties that new error appeared or existing error is gone. So far so good. Another problem is how we would find which control’s DataContext we should take? For example, if you have ItemsControl of something editable – each item has its own DataContext. To answer this question we need to know a bit about WPF’s Binding Validation mechanism. It is implemented via Routed Events, particularly ErrorEvent in the System.Windows.Controls.Validation class (if you want to know more about Routed Events – you may start here). ErrorEvent is raised in the WPF Binding mechanism whenever error appears or disappears (actually, Binding calls Validation.AddValidationError and Validation.RemoveValidationError methods, which in turn call RaiseEvent). The target of this routed event is the DependenencyObject that owns bound DependencyProperty. As this event has Bubbling strategy, it then re-raised for each parent control in the Visual Tree from target until either the root is reached or someone marks event as Handled. Now we need to write last piece – UIValidationRule which will actually validate the input. The goal here is to make it as easy to use and extensible as possible: first because we don’t won’t to use clumsy long XAML code pieces and second because we may want to write many slightly different rules: for ints, doubles, DateTimes etc. Also we want error messages to be customizable and localizable. Hence UIValidationRule will be an abstract base class which will be extended then. Here Func<string, CultureInfo, string> takes string representation and culture info and returns null if validation succeeds and not null string with error message otherwise. /// Specifies that empty string and null values should be allowed by the validation mechanism. Well, don’t forget to put UIValidation.IsUIValidationErrorSink="True" somewhere in your XAML. Some time ago I wrote about weak events including non-standard ones. While this post is not totally dependent on weak events, I will assume you’re acquainted with MakeWeak method. Really, sut variable’s value is eligible for collection at highlighted line, so it is collected (our event has weak subscription, remember? ), and event is never raised. Visual Studio 2012 Update 2 has changed something in MSTest so that it broke compatibility with ReSharper. From the description it seems it forced JetBrains to release next version on ReSharper, so users of R# had problems only for one week. Great work, actually: I bet it is not a trivial task to establish development process that allow something of R# caliber to be released in one week. Though it is another nail to MSTest coffin, IMO. It is not only stuck in place and not evolving (gosh, they can’t make asserts for exceptions or even fix bug that ExpectedException attribute don’t check message even if asked to for years! ), but actually disrupt work process from time to time with breaking changes, strange SEH exceptions or incompatibilities. I’m extremely happy we were able to abandon MSTest and adopt NUnit. If you have new project and deciding which unit-test framework to use – do yourself a favor and avoid MSTest as much as possible. Our office has corporate proxy – and that’s pretty common as far as I know. And it happened that our proxy has NTLM authentication which is not very common/popular among linux users (that’s an understatement, I know). So git and msysgit don’t support it out-of-the-box. And it will take almost forever by the way (dozen of minutes in my case). Note three backslashes, it is not a mistake. But you already see the problem, don’t you? git config is saved in plaintext and I’m not very like the idea to store my password like that, even if in some location where nobody has access rights (domain administrators could see everything in the domain, remember?). And passing token instead of login/password is beyond msysgit abilities. You may think: if I’m able to get to github in browser, even over SSH, then why git can’t? Maybe there’s some way to intercept git’s queries and wrap them through correct proxy/auth headers? And you’d be right: there is tool capable of that, name is cntlm. Fortunately, now the bug is fixed (at the time of writing, latest cntlm version was 0.92.3). So, what it is and how you can use it? Cntlm is the proxy itself, that you run on your local box and when it receives a request – it re-sends it to so-called ‘parent proxy’ (which is exactly your NTLM-authenticated beast) with correct auth headers. Just paste these PassNTLMv2 string to the cntlm.ini (don’t forget to type your own username and password instead of the ‘username’ and ‘password’ strings above). Don’t touch PassLM or PassNT tokens if your system supports NTLMv2 because NT and LM are not secure. It would be all of the configuration. Run ‘cntlm.exe’. You could try ‘cntlm.exe -v’ to activate verbose mode and have much info on the console and see if something went wrong. If you run cntlm without params – it will go to daemon mode and will silently run in background, listening for 3128 port (by default – can be changed in cntlm.ini easily). And by default it won’t accept connections from others non-local programs, so that your box will not become a gateway for everything possible if someone knows you’re running cntlm (that can be changed as well). remote: Counting objects: 7992, done. remote: Compressing objects: 100% (2160/2160), done. Receiving objects: 100% (7992/7992), 39.44 MiB | 217 KiB/s, done. Resolving deltas: 100% (5944/5944), done. That’s it. In case you’re interested in detail info about cntlm command-line parameters, here it is. In the first part I introduced RequiredPropertyAttribute and integrated it with Windsor. And the problem of preventing manual instantiation of such classes (because manually nobody is forcing us to treat such properties as required in any way) remained open. So, the best thing possible from my point of view would be compiler emitting warning each time we create such classes. Then you will have a clear sign you’re doing something not-intended. Or, if you have “Treat compiler warnings as errors” – it will not allow you to even compile such code. I believe with Roslyn it is not so hard to write custom inspection for this and warn user whenever required. But for now it is not that easy unfortunately. At least I haven’t found better way than described below (if you know one – let me know, please). compiler enforces “viral propagating” of the attribute. And that is a good thing, obviously. Now, some disadvantages clearly present as well. First off, it is a hack and using Obsolete in not-intended way. Also you have no means to avoid setting this long string line if you want clear warning message (ObsoleteAttribute class is sealed unfortunately). And finally, if you’re developing some library and making it backward-compatible – there’re good chances you need Obsolete for your own legitimate use. Thus said, if you want to incorporate this approach – you will be marking as Obsolete some internal implementations which probably will not be seen by user of your library anyway. And obviously, this approach doesn’t defend you against reflection. But reflection is absolutely another story where you have much less guarantees by default, so I think it is ok. Though I’m not absolutely content with this solution – it works and I can’t think out something better right now. And I can move my app to property injection more or less sure that required properties will be really required, and these requirements would be checked as early as possible. Inspired by this post I tried this approach myself. If you haven’t read it yet – it’s time to spend several minutes there. The main reason I was reluctant to use “infrastructure dependencies as properties, application-level dependencies as ctor arguments” is that it is very easy to miss the required property and find oneself one day in debugging because of some silly configuration error or forgetting to set a property. I strive to use static checking as much as possible and detect errors in compile-time or build-time (on build server where some additional checks are taking place). On Inversion of Control Container (IoCC) side it can be solved – as Krzysztof suggested – via configuring so that it treats them as required. Here I will show things using Castle Windsor 3.0, but the approach overall is not specific to concrete container. The default way in Windsor to make property required is at configuration time shown here. Personally I don’t like that very much, because in this way you need to find registration and look through it in order to understand if some property will be filled always or not. It is much cleaner and easier to read if it is immediately obvious right in the property declaration place, thus making custom attributes natural choice. As far as I’m aware Windsor don’t have built-in attribute for that, so let’s make our own. It is easy if you know where to look. I have to admit I spent about an hour to find the place and another 15 minutes to write implementation and tests for it. Now, you may use this attribute and Windsor will treat both constructor dependencies and marked property dependencies equally required. But still, there’s one problem. What if someone will create some class by manually calling the constructor? Well, maybe he even will be attentive enough and checks which properties are required and sets them properly. But still such code would be defenseless against change in the class being created. What happens if later another (not so attentive) developer adds some required property? Clearly, he needs to check every site where class is created manually and satisfy that new dependency. In other words, allowing to create such classes manually is a way to make IoCC’s work by hand. Clearly not a good thing – if we have IoCC – we should use it, otherwise why it clutters the code? But how one can prevent creating some classes in code, but still allow IoCC to create them? I will describe one way in part 2 shortly. It is not perfect, but it works and makes unintended error much less likely. There’s very useful ability in Visual Studio 2012 that is disabled be default – I don’t know why. It can be enabled through Tools -> Options -> Environment -> Tabs and Windows -> Show pinned tabs in separate row. You can see that all tabs placed to single row. And some of them even hidden – to look at them – you should click drop down button at the right side of tabs row and select tab you’re looking for. Well, when you need more than four or five tabs at once (maybe a little more depending on your display size) – it quickly becomes very inconvenient experience. 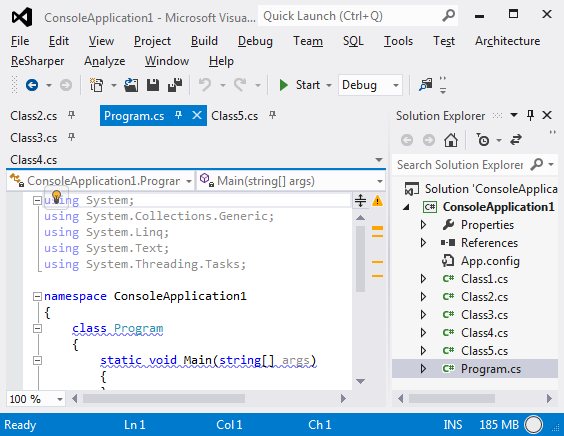 It is almost as if Visual Studio 6.0 is back! Do you remember that VS 6.0 has multi-row tabs from the start and then in VS 7.0 this useful feature was removed for some reasons? Well, now it is back. And in conjunction with Preview Tab (you can find more info about it here) it shines even better than before.